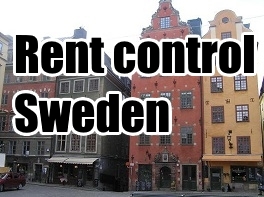 To begin our series profiling the rent control situation in EU countries, we will take a look at the impact of rent control on the private rental market of Sweden, with a focus on the capital city of Stockholm where the city limits are home to 900,000 of Sweden’s 9.9 million citizens. The rental market there is a relevant reflection of the country’s conditions as a whole given the importance of the city to the economy in general. Sweden has perhaps the most pro-tenant laws in the world, and has been held up as an example for other EU nations investigating rent control legislation. The reasons for the attractiveness of the example are largely because people look at the terms tenants in an existing tenancy face. The issue that arises, however, is that in creating such a tenant-friendly environment, the Swedes have subsequently alienated landlords and generated a dramatic shortage of rental properties, that aspect of their market is rarely raised when drawing comparisons. To make a 5% return on investment, a Swedish developer would need to set rents 70% higher than allowed by the Rent Tribunal according to the European University Institute. This is still below the generally accepted international benchmark of 7% to get a risk-reward in real estate. Currently, Sweden lacks 40,000 rental flats and the problem in major cities such as Stockholm is so advanced that the Stockholm City Council has introduced an official housing queue. Each day waiting for housing earns a prospective renters one point, and to earn a place in the city, renters need not only the money for rent in hand, but also enough points to be first in line. This dramatic shortage of housing is a direct result of the stringent restrictions placed on landlords by the Swedish Rent Tribunals. In an effort to address a symptom (rental market problems) they created a brand new disease (housing shortages). Rents in all dwellings must match rents for alternative, comparable dwellings, based on size and ‘attractiveness’, primarily rents in low-rent municipal houses, and these rules apply to all rented dwelling units, with few exceptions. The tenants also, in the first-hand market (a distinction which will be discussed shortly), have all the power; the tenant retains the right to prolong their contract, essentially forever. The rule is totally asymmetric; a tenant may at all times serve three months’ notice, even when the contract is fixed for a certain time, and terminate the agreement. This gives all of the negotiating power to one party and effectively removes it from another, an imbalance that comes with consequences. However, the process of preventing ‘prolongation’ of the lease is significantly harder for the landlord. If the landlord’s reasons to seek termination are high, such as in the case of necessary construction work on the premises – ‘prolongation’ can be removed from the tenant (which reduces the tenant rights), but only if the landlord can offer them a replacement home. Furthermore, supply falling this far short of demand has allowed for the creation of a booming resale market where people sell their leases. As mentioned, there is clear stratification between first-hand and second-hand leases. For first-hand leases, tenants hold the power, retaining the right to redecorate the interior, re-paint, lay wall-to-wall carpets, and change interior doors without the landlord’s consent, this may seem minor, but if they use decor that is eccentric and needs to be changed in order to re-let the property it can impose large costs on the counterparty (landlord). Conversely, second-hand leases, e.g. leases which are purchased from the primary leaseholder and vary in duration from a single month to a year or more, are traded on EBay-like websites, and the extreme demand means that renters are able to impose stringent regulations on any subsequent renters, this perversely leads to a situation where a renter has less rights when renting from another renter than they do if they rented directly from a landlord. One result of this situation has been the development of a booming black market for the sale of first-hand leases. There are estimates that this black market business is worth in excess of 1.2 billion SEK, (€128m) and will continue to flourish until rents are either allowed to rise to market rates, or housing production outpaces demand. The core issue at the Swedish decision to implement rent control, their desire to combat inequality and grant fair access to housing for all, is ultimately subverted by this practice. In a free market system, those with the ability to afford desirable housing will always find housing, and those who cannot will be unable to. It shows that despite best intentions the very egalitarian Swedes have failed to use a state controlled system to create the outcomes they had hoped for. Another problem being raised is that due to the existence of bribes or other ways to game the system there are allegations of being able to buy your way to the front of the line, or subvert the municipal housing organisation entirely, those with the means are still receiving first access to housing, and those without are languishing in queues that take the better part of a decade, or longer. Their waiting list is over 500,000 people long, clearly a market with big issues. Rent Setting in Sweden. Rents are not frozen or capped, but increases are negotiated through mass collective bargaining between landlord and tenant unions. That’s an excellent resource, thank you for posting that in your comment! This Swedish advertisement shows 2000 applicants for an apartment. Denmark has similar housing queues, as does the Netherlands. If the price is below market price, then there will always be a queue or lottery as more people can afford to apply. These countries often have strict land controls, which means that even if a new build is profitable, you wouldn’t get approval for it anyway.